The water in the pan allows a homogeneous distribution of the fire on all the surface of the pan giving it a strong thermal radiation with flames rising up to 3m high. PYROS 3, the largest flame generator in the range, has a very large fire surface area of 0.83 m². Two remote controls supplied for controlling the fire (ignition and extinction) at distance. A handy wireless remote control to accompany the trainee towards the fire, without cable and wired remote control. Integrated solenoid valve for automatic and immediate gas control. Emergency stop button located on the console. Easy drainage ensured by handles for secure handling of the pan and wheels that allow the pan to be moved easily and tilted effortlessly. Storage space next to the igniter for the wired and wireless remote controls. Storage space under the console to accommodate a bottle of gas. 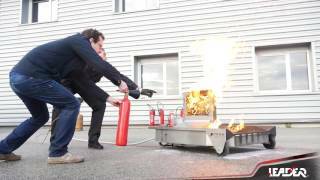 PYROS 3, the most powerful fire trainer in the range, produces very powerful flames (up to 3 metres high) and high thermal radiation for realistic and impressive training. 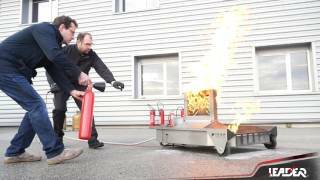 For safe training, closer to the trainee, the fire trainer is equipped with a control panel and remote controls for perfect control of the fire (ignition, extinction and flame height) and control of the gas supply. 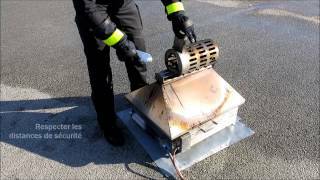 Demonstration of PYROS 3 fire trainer: ecological flame generator with water, perfect for safe training on different fire extinguishing equipment! Discover the many modules of PYROS 3 to simulate different types of fires and customise your training!